2015 wasn’t particularly a great year for Bollywood and that prompted me to make an “India Top 10” (against a “Bollywood Top 10”) list despite limited exposure. At the outset i must admit not being fortunate enough to watch acclaimed movies like Killa, Masaan, Titli and Tamasha. Nevertheless here’s my best ten from India 2015; and one will be surprised by the versatility of stories, entertainment and depth the top ten has to offer from ‘Incredible India’. 10. Kakka Muttai (Tamil – The crow’s egg) – Kakka Muttai is the first tamil movie i watched at a theatre, on behest of friends. The story of two rag pickers who (too) fall prey to western cuisine and make it their life’s sole objective to eat pizza, ignoring local food, is as different a story as can be. There is one scene where two rich kids give away their new clothes only to eat Indian street food (paani puri), whereas our protagonists are running after the much publicized Italian fare. Show this movie to your kids one day. 9. Badlapur (Hindi) – Badlapur belongs to the same genre as Ram Gopal Varma’s epic trilogy (Shiva, Satya, Company) and director Sriram Raghavan’s previous flicks – ie a crime story based on unpredictability, style and performances by leads. Nawazuddin Siddiqui and Varun Dhawan make this a must watch story of a routine bank robbery which effects an innocent family forever. By forever, i mean revenge, which spans across decades! 8. 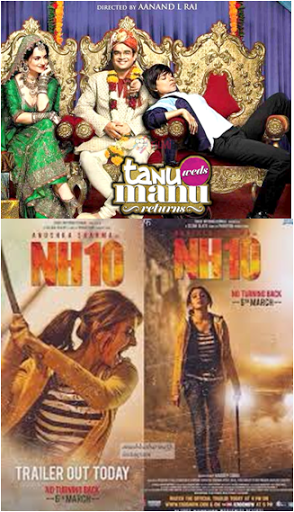 NH10 / Tanu weds Manu Returns (Hindi) – It was difficult to separate either but two female oriented movies shone thanks to their leads. NH10 is dark, grim, on your face and shows us the mirror of state of security at highways in India while TWMR is through and through entertainer with some levels of fantasy. Anushka Sharma and Kangana Ranaut give us every reason to await their next flicks. 7. 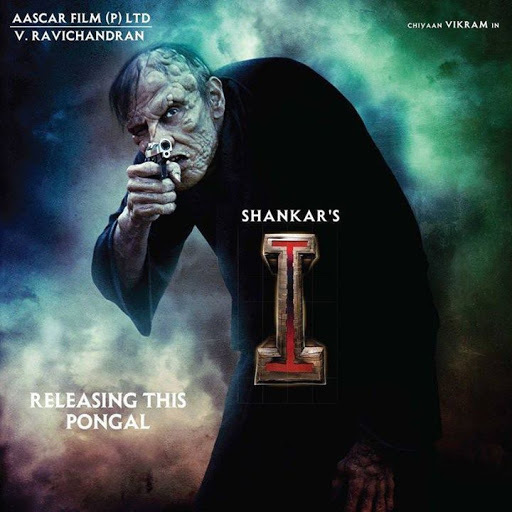 I (Tamil) – Released in early (January) 2015 doesn’t mean this gem can be forgotten. It’s not a movie without flaws but a simple revenge story has been treated with enough thrill, masala, entertainment and content. I saw this movie twice and was every bit worth it. Vikram’s is top draw as the local bodybuilder superstar whose life, dreams are shattered as his body gets deformed to unimaginable levels. Watch him in emotional scenes carried with a deformed body. 6. 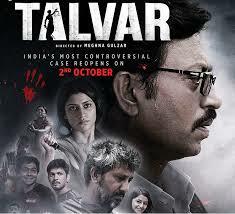 Talvar (Hindi) – Talvar recounts the events behind India’s most inconclusive murder mystery for which the parents of victim are currently languishing in jail. The movie recounts three investigation procedures and how each conclusion is different from the other, but equally believable to biased minds. However the movie, aside the thousand questions it puts in your brain, belongs to Irrfan Khan – India’s big export to Hollywood. His version seems most convincing, thanks to the actors prowess more than anything else. This movie hoped to re-open the case of a thirteen year old young girl whose throat was slit by someone she knew, trusted and saw everyday. But no one knows who. 5. 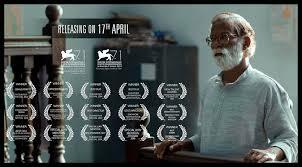 Court (Marathi) – Court is India’s official entry to Oscars and rightly deserved. A local folk singer is arrested on charges that his songs provoked a sewage cleaner to commit suicide. Court is a statement on our judicial system and shows how simple lawyers with utterly simple lives (travelling local trains, watching tv soaps) are entrusted with the most complex of cases. And India is complex – the sewage cleaner entered the drain only on days he spotted cockroaches roaming around – which meant no poisonous gases for the day to inhale. Low on entertainment but hard hitting on your senses, I wish Court all the best for Oscars. It deserves it. 4. Papanasm (Tamil) – Papanasm is a crime thriller based on human psychology that whatever is told repeatedly is believed soon enough, irrespective of status of the truth. A happy family become victim of an unfortunate incident but when the going got tough, the tough got going; and got the best out of a village simpleton. Papanasm is remake of Malaylam movie Drishyam, same name used for hindi remake later in 2015. But Kamal Hassan in this Tamil version is so outstanding that it makes Ajay Devgun’s flick less enjoyable. 3. Bahubali (multiple languages) – Bahubali is India’s answer to Gladiator, Braveheart and 300, combined. This magnum opus is first movie from Hindustan which ends with an incomplete story, a sequel to await and historical box office collections. It’s one movie of 2015 worth multiple viewing at big screens. The movie is so high on visuals that not knowing the language wouldn’t be a handicap, and that’s an understatement. The war scenes, its explanation, the strategy are surely the best i ever saw on screen. More so for its simplicity, which makes it easy even for the lowest common denominator audience to grasp. 2. Piku (Hindi) – Piku is story of an aged, insecure father obsessed with his daily bowel movements. I cannot think of any industry which could make a classy, real to life and through provoking movie based on excreta. Led by colossal performances from Big Bachchan, Deepika Padukone and Irrfan Khan, this would have been my pick for Oscars from India. The movie is a strong underline that every human only thinks for ownself, own insecurities and gets utterly selfish as they age, to the point discouraging his own young daughter’s from marrying. 1. Baby (Hindi) – Baby is fictitious account of India’s unselfish spy network who avenge the real life Mumbai terror attack 2008, by killing the masterminds in their own dens. Having watched it thrice this year, had to put it as number one. Baby is the reason why Akshay Kumar’s Airlift is eagerly awaited and an ordinary Phantom also made money middle of the year. High on patriotism, low on jingoism, Baby shines for its style, edge of seat thriller for entire duration and Akshay Kumar who fits the bill of perfect spy. Salute to our entire espionage network. Previous Previous post: ‘Dilwale’ (2015) winning hearts overseas?